In Georgian Bay Forever's Divert and Capture project, we are installing 100 washing machine filters (Model: 160 Filtrol from Wexco) in Parry Sound households. We are partnering with Lisa Erdle, a student from the Rochman Laboratory at the University of Toronto. She will be sampling water from the effluent of the Parry Sound wastewater treatment plant, and measuring the impact these filters are having on the reduction of microfibers that flow into Georgian Bay. According to Capturing microfibers – marketed technologies reduce microfiber emissions from washing machines 1 ( McIlwraith at. al), the Lint LUV-R (a filter similar to the FIltrol 160) captured 87% of micofibers in the wash by count. Microfibers come off your clothes during laundering, and since most of your clothes are likely made from synthetic materials many of them are plastic. These tiny strands of plastic (less than 5 mm) can be as high as 700,000 per wash load depending on the amount and the synthetic materials in the wash (Napper and Thompson) 2. 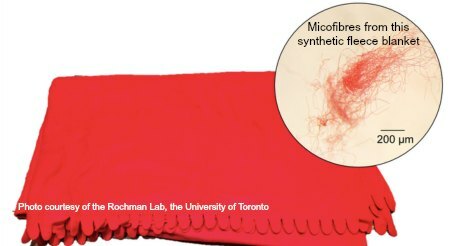 In the Capturing microfibers 1(McIIwraith et.al) published research paper, 90,700 to 138,000 fibers are estimates based on washing one synthetic blanket. Some further 'downstream estimates' show some potentially very alarming consequences. We all need to do things differently to protect our freshwater - from changing our fashion choices away from synthetic materials and clothes that have a short-life span, to decreasing our frequency of clothing purchase, to reducing the number of washing loads we do, to installing filters on our washing machines. Georgian Bay Forever (GBF), thanks to our funders and partners, aims to build on the microfibers research and test a filter solution in the field - with real households - in a Parry Sound Field Study we are calling Divert and Capture. When complete, in about 2.5 years, these results will be shared with stakeholders, manufacturers , and the public to influence change in our habits that are currently leading to the build-up of plastic in our freshwater. Enjoy this 3 minute video of GBF's Amber Gordon-Bunn removing a month's worth of microfibers from her family's washing. Read more about microplastics and this project at this link, "Microplastics Impacts" . 1. 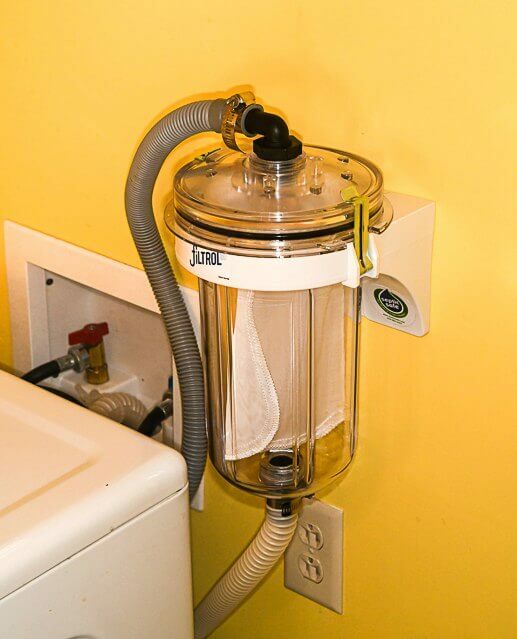 Buy a filter for your washing machine. For the Divert and Capture project, GBF is installing the Filtrol 160 from Wexco into Parry Sound residences. There are other filters on the market. 2. Until better solutions and more research is completed on microfibre and microplastics impacts - general tips include avoiding over consumption of clothing and particularly synthetic clothing, decrease your laundering, and minimize one-use plastic like bags and coffee cups and lids. 3. Undertake clean-ups of your favourite shorelines in Georgian Bay and dispose of the litter in the appropriate manner. You're helping water quality for the plants and animals in the Bay and restoring shoreline beauty. and our many community volunteers! And our many dedicated and passionate friends and donors. GBF continues to fundraise for $50,000 a year to expand this program. a) expand the project with more households b) expand the areas identified for clean ups c) educate more people on what microplastics are and what everyone can do to help stop the contamination.